Have you ever played that dinosaur game on Chrome when the connection gets lost? 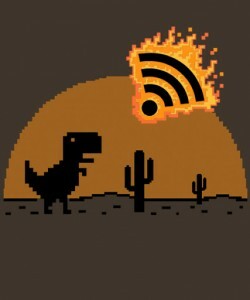 It really makes you look at the wifi icon differently, doesn’t it? As soon as that’s back on, the dinosaur disappears. It becomes the meteor that drove the dinosaurs to extinction. And then you lose your high score and everyone is sad. Except happy at the same time because now the wifi is back on. And now that the dinosaurs are gone, the humans have a chance to exist. So bittersweet. Wrap this cloth around your torso to remind yourself of the dinosaur’s sacrifice.